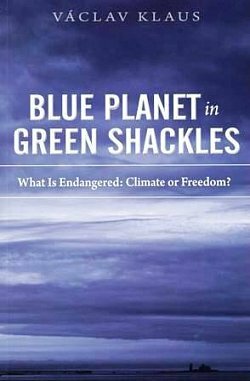 Blue Planet in Green Shackles. What Is Endangered: Climate or Freedom? The greatest challenge facing mankind is the challenge of distinguishing reality from fantasy, truth from propaganda. Global warming has become a symbol, and example of this clash. The one politically correct truth has already been established, and opposing it is not easy. Future generations will wonder in bemused amazement that the early twenty-first century’s developed world went into hysterical panic over a globally averaged temperature increase of a few tenths of a degree, and, on the basis of gross exaggerations of highly uncertain computer projections, proceeded to contemplate a roll-back of the industrial age. The advocates and promoters of the global warming hypotheses are mostly scientists who profit from their research, both financially and in the form of scientific recognition, and also politicians (and their fellow travelers in academia and in the media) who see it as a political issue attractive enough to build their careers on. The current – so unfairly and irrationally led – debate about the environment and about global warming in particular is increasingly becoming a fundamentally ideological and political dispute. The largest threat to freedom, democracy, the market economy, and prosperity at the end of the 20th and at the beginning of the 21st century is no longer socialism or communism. It is, instead, the ambitious, arrogant, unscrupulous ideology of environmentalism. This ideological stream has recently become a dominant alternative to those ideologies that are consistently and primarily oriented toward freedom. It is a movement that intends to change the world radically regardless of the consequences (at the cost of human lives and severe restrictions on individual freedom). It intends to change humankind, human behavior, the structure of society, the system of values – simply everything. Even through environmentalism boasts about its scientific basis, it is, in fact, essentially a metaphysical ideology that refuses to see the world, nature, and humankind as they really are. It has no regard for spontaneous evolution and takes the current state of the world and nature as an untouchable standard, any changes to which would be a fatal jeopardy. The environmentalists’ attitude toward nature is analogous to the Marxist approach to economics. The aim in both cases is to replace the free, spontaneous evolution of the world (and humankind) by the would-be optimal, central, or – using today’s fashionable adjective – global planning of world development. What is at stake is not environment. It is our freedom.